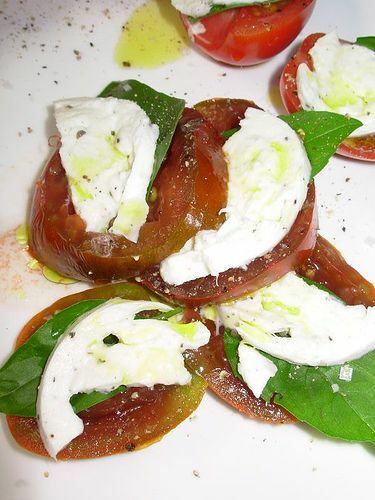 Insalata Caprese (salad in the style of Capri) is a simple salad from the Italian region of Campania, made of sliced fresh mozzarella, tomatoes, and basil, then seasoned with salt, pepper, and olive oil and sometimes a drizzle of balsamic. 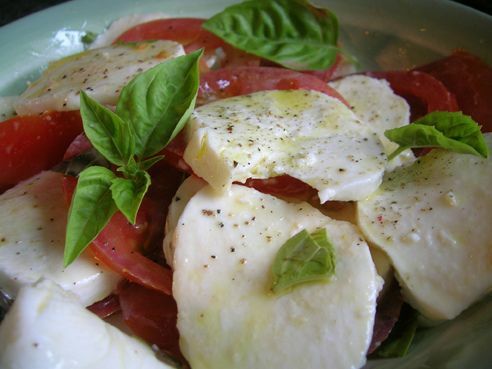 Properly made Insalata Caprese is one of the simplest and tastiest dish. It requires only the right ingredients. This is basically a summer dish from which the tomatoes should be ripe, red, juicy and flavorful but not overly soft, and preferably unrefrigerated. Next, the basil should be young and truly fragrant; The next essential ingredient is good quality fresh, moist mozzarella; and finally, you need genuine extra-virgin olive oil, the best you can afford! 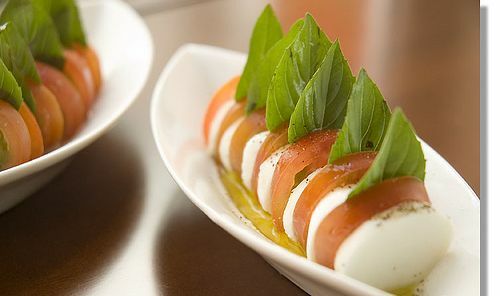 Fresh mozzarella are sliced into discs of moderate thickness and alternate them on a platter with sliced of the ripe tomatoes, overlapping for effect. Tear a good bunch of fresh, fragrant basil leaves and sprinkle liberally over the slices. Add salt and freshly ground pepper to taste. Then, just before serving, drizzle on some excellent extra-virgin olive oil. 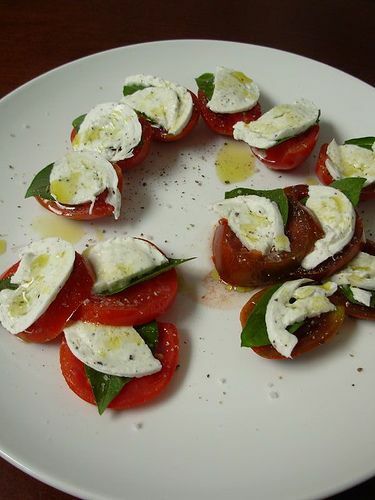 Insalata Caprese should never be allowed to sit in oil for any length of time and become soggy. 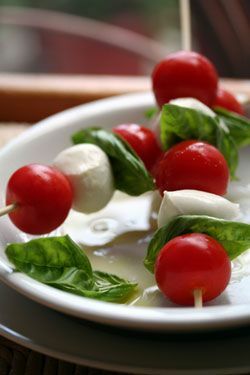 If the tomatoes are ripe and juicy, the basil fragrant, the mozzarella moist and fresh, and a drizzle of the best olive oil then you will taste the freshness of the ingredients and let me tell you this is a wonderful summer dish to start a meal. 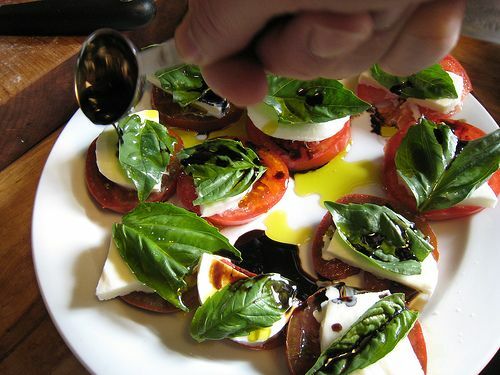 Different ways of arranging the Insalata Caprese. 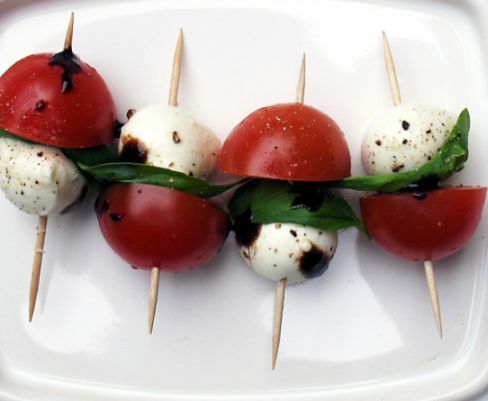 Caprese in brochette! They are great and perfect as appetizers, especially if you have a large crowd. 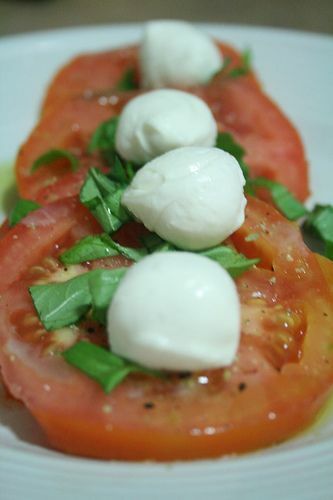 If you can find Buffalo Mozzarella buy them because they are the best Mozzarella balls. They are made with water Buffalo milk instead of cow's milk.